They say that every bicycle weighs the same; a lightweight (and by extension, expensive) bike requires a heavy lock whereas its cheap and cheerful cousin (which weighs more) can make do with a lighter version. If you own a lightweight road bike it’s likely that you often ride without any lock at all, but what to do when you stop for a coffee or loo break? Hoping to solve this particular conundrum is HipLok with its new Z LOK. The Z LOK is a reusable reinforced zip style tie for use on car racks, with accessories and other outdoor equipment. While the Z LOK might look similar to a conventional zip tie, it features a stainless steel core to deter the opportunistic thief. We know it’s stating the obvious, but the Z LOK is not rated by Sold Secure and, as such, it’s use as a primary lock will render your cycle insurance policy void. Its designers intend the lock to be used to deter opportunistic thieves when the bike is within your sight. The Z LOK costs £14.99 for a pair. We have a pair of Z LOK zip ties to give away. Leave us a message at the bottom of the page and we will draw a winner at random. How do thieves steal bikes? A few years ago, the lock manufacturer Kyrptonite suffered a bout of bad PR when it was alleged its D-Locks could be opened with a modified Bic Biro. The episode called into question the efficacy of many cylindrical-lock products, but in reality most thieves don’t have the time, patience or skill to pick locks – they prefer to cut, freeze or smash them. A well-equipped and determined bicycle thief can defeat most designs of lock within minutes and with many bikes now worth thousands on the second-hand market, the crime is rife. And when a thief is unable to remove a lock, it is not uncommon for him to vandalise the bike or simply steal parts. Thieves in London this spring have taken to stealing handlebars from road bikes. Once a few control cables are severed, they walk away with bars and shifters worth hundreds of pounds. The lesson is that even stoutest lock is no replacement for a good cycle insurance policy. Cycle insurance from the ETA includes the theft of parts – get an instant quote. I love the simplicity of these, they are a nice compromise between a heavy lock and nothing. Z LOK zip tie me up please ETA! These could also be used to supplement larger locks to provide some deterrence for the theft of components, such as saddles. My daughter had a lovely helmet stolen off her bike recently and it’s really annoying!!! I am always petrified of leaving my precious stead anywhere, even for a wee break. Nice idea HipLok. Thanks to ETA for the opportunity. Would be great when I need to buy something on a control point during an Audax. Fine for a few minutes I believe. More useful to protect a cycling accessory than your cYcle. Let’s face it. Securing with a proper lock takes how many more seconds? As for the extra weight…. Great idea. Also handy to secure a wheel not protected by the main lock. 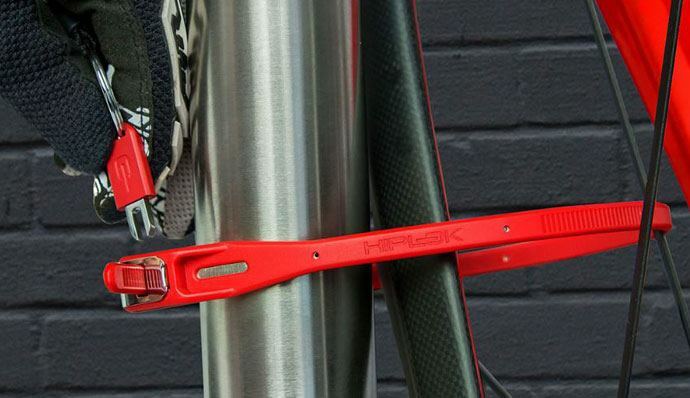 A very useful lightweight addition to a cyclists’ defence against theft. For example, at a cafe when the bike is pretty much nearby throughout, or for securing accessories when you stop and leave the bike. My son has been unlucky enough to have several bikes stolen in the notorious hotspot of Cambridge. Despite this, he is cycling more than ever and I’m sure he would appreciate a pair of these! Security simplicity. Never be without Z LOK protection! Lightweight lock – a great idea for quick locking. Yes, please. Handy and can be placed in a pocket… that said my “loo”, as a rule, would be a hedge so not a problem. A cafe is a different proposition altogether. A couple of these would be a useful supplement to my regular lock to secure my luggage when on long cycle tours. It’s often not possible to remove luggage when stopping for a break or food and the added security would be reassuring. Gimme gimme gimme a lock after midnight! I can see several potential uses for one of these and would love to try one out. Thanks for the opportunity to win one ETA. Light weight is clearly the number one feature. Great for a quick stop. What a simple idea. Wish I had thought of it! Would love an opportunity to try them out. So handy to keep something light in your bag. Would love these please. Yes please! Would be great for securing saddle etc when leaving my bike at the train station. Very useful for securing your quick-release wheels too.